She is also the author of Green for Life and 12 Steps to Raw Foods. Boutenko explains how green smoothies are an easy way to improve our health and increase our intake of fresh produce by blending together fruit and leafy green vegetables. Boutenko says, “Ever since the invention of the green smoothie, I have been drinking them daily and sharing them with others. Through everyday blending, research and letters from our readers, we have compiled the best recipes and basic principles of green smoothie creation and consumption in this new book”. Green Smoothie Revolution starts by discussing the importance of leafy green vegetables in the diet and their nutritional components. Boutenko then goes on to talk about her discovery of green smoothie recipes and how this enabled her family to dramatically increase their intake of greens in a form that was enjoyable. She highlights the importance of getting a wide variety of greens in your diet and introduces readers to a large list of greens including cultivated and wild edible greens and herbs. She also explains the differences between green juices and green smoothies and provides answers to frequently asked questions about green smoothie recipes. There are also sections about food combining for green smoothies and guidelines for optimal green smoothie consumption. The book Includes 200 smoothie recipes separated into various sections including, green smoothies for beginners, supergreen smoothies, savory green smoothies and soups, green smoothies for adventurous souls, green puddings, green smoothies for children and green smoothie recipes for pets. At the end of the book is a story of Clent Manich, who has lost over 200 pounds by drinking green smoothies. Fruit, leafy green vegetables, avocado, coconut, flaxseeds, sunflower seeds, sesame seeds, cashews. The Green Smoothie Revolution gives information about green smoothies and recipes and does not include exercise recommendations. 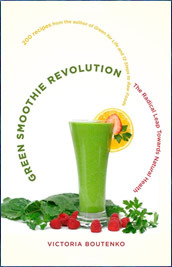 Green Smoothie Revolution: The Radical Leap Towards Natural Health retails at $14.95. Makes it easy to consume a high intake of fruit and green vegetables. Many people have reported dramatic health improvements with regular consumption of green smoothies. Research supports the use of green smoothies to improve digestive health. A diet based on green smoothies is low in fat and high in nutrients, which is associated with a reduced risk of heart disease, diabetes and cancer. Provides a large selection of smoothie recipes. Contains unique and detailed information about green smoothies. Drinking green smoothies may not appeal to some dieters. Dieters who consume only green smoothies may potentially be at risk for several nutritional deficiencies including protein, vitamin B12 and selenium. Requires a large amount of fresh produce, which may increase the expense and inconvenience of grocery shopping. Green Smoothie Revolution provides comprehensive information with a large selection of recipes from the creator of green smoothies, Victoria Boutenko. It will appeal to dieters who are ready to make a dramatic lifestyle change as well as those wishing to improve the nutritional quality of their diet. Boutenko, V. (2009). Green smoothie revolution: The radical leap towards natural health. North Atlantic Books.